Crow fledgling and parents reunited! Lesson from a crow parent: A fledgling left on his own does not mean he has been abandoned. The traffic on Venables Street was busy as I walked up the north sidewalk on my way to Commercial Drive to get lunch at a nearby cafe. I noticed a crow standing on the sidewalk with his back to me. He was facing the wall of an industrial storefront. I stopped a few feet away and looked to see if he was injured. There were windows above the wall where he stood, so I wondered if he’d flown into one and was stunned by the hit. He stood quietly with his eyes closed as though sleeping. A woman came out of the shop and we chatted. She hadn’t heard him hit the window. Then, he opened his eyes and blinked a few times. They were blue, so I knew he was a young one. He had a short tail and looked a bit rough around the edges. He turned to me and gave a squawk. Just one. I called back and he stepped towards me. I looked around to see if there were any adult crows nearby, but couldn’t see anyone. I was hungry, but I didn’t want to leave him unsupervised. I feared he may wander out into traffic. I called Greg and told him about the crow baby. He offered to come watch and to bring a cardboard box in case we needed to rescue him. When Greg arrived with the box and a towel, I called Wildlife Rescue Association (604 526-2747) and left a message as instructed by their answering machine. I went for food and Greg stayed behind to supervise. After about 20 minutes, a woman called back. She advised that this is fledging time for crows. Young ones will experiment with flight and forays away from the nest. She said it is normal for parents to leave fledglings on their own for up to an hour. She also asked to notice if he’s pooping. If so, it indicates that he’s not been abandoned and has recently been fed. She said to watch him and if after an hour no one comes to claim him, place him in a cardboard box and bring him in, or to Animal ER, the emergency facility in Vancouver where transport animals to Wildlife Rescue. 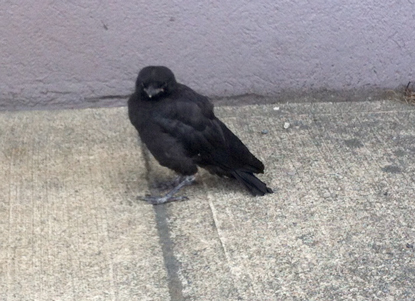 When I returned to join Greg, the little crow had wandered down the sidewalk and was looking at a glass door. Thinking his reflection was another crow, he tried to fly into the glass. After a few minutes he gave up and flew onto the roof of a car. We were now quite worried he’d fly into traffic. He may not have the skills to avoid the moving cars. We looked again to see if any parents were nearby. We saw a crow heading south across Venables, towards a tree a few hundred yards away. She flew inside the tree. She had a nest there. We couldn’t see the nest, but this kind of flight—to a destination deep in the tree—is an indicator of a nest location. We saw another crow fly north overhead. The young crow saw this one and called to him. I thought these must be the parents and that they were looking for him. It would be a good idea to move him away from the traffic and towards the nest. 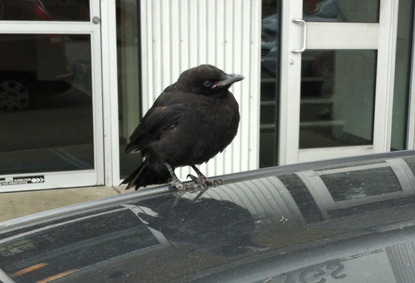 So we gently coaxed the crow off the car and towards the sidewalk. He swooped down and walked over to a storm sewer drain and looked down into it. He was probably thirsty. Greg slowly corralled him into a corner against the building where he scooped him up with the towel. We carefully put him in the box, removed the towel and shut the flaps. The fledgling protested by calling and rattling around while I walked with him across Venables and towards the tree. I found a grassy bit about 30 meters away from the tree, and well away from traffic. I put the box on the ground and let him out. He walked over to a telephone pole, as though looking for cover, and stood beside the pole for a few seconds orienting himself. He called again, and this time the parents saw him. And me. The adult male, complaining, swooped down at me. I turned around and calmly walked away from the baby, simultaneously explaining the situation to the male. I didn’t want to harm the young one, but was trying to help him find his parents. Satisfied—that I had moved far enough away or had given a good enough explanation—he turned from me and flew up onto the telephone line just above the fledgling. I watched as the female joined the baby on the ground. She touched his beak with hers and reassured him with a few quiet words.